ASP.NET Forums/General ASP.NET/Web Forms Data Controls/DataPager does not work as expected. DataPager does not work as expected. The listview is filtered, the datapager show the correct number of pages but when I click in one of those pages the listview shows all the records. Maybe the problem is with the page postback. Re: DataPager does not work as expected. If you are using SQL server the code shown always returns every record. If you are using some other DB engine then maybe the txtFind textbox is empty which will produce all records as well. The quickest way to a solution is setting a breakpoint and debugging the code. View the SQL script and parameter values for correctness and try running the resulting SQL against the DB. At the button you get 5 pages, the filter works fine. If you select page 2 you see the filter gone away and you get all the records. I Think the problem is with postback of the page. There is not enough code to guess where your logical bug is located. I used dev tools to see the POST and found the txtFind value is submitted. My best guess is you have code elsewhere that is binding the listview to a query that returns all the records. You need to learn how to troubleshoot and debug. Set a breakpoint and step though your code. You wrote the code and know how you expect the code to function. As you step through the code you should be able to identify the point where what you think should happen and what actually happens differs. This is where the bug(S) is located. The following code is very simple, it has one listview, one datasource, one DataPager. According to the code only Button1 is wired to the Procura event handler and only the Procura event handler filters the ListView. You've code the DataSouce to to select all records and that's why clicking DataPage shows all records. If you would have simply placed a breakpoint on the Procura event and ran the debugger this fact would have been abundantly clear. The page is working exactly as you coded it. I would place the filter logic is a separate method and call that method from the Procura event handler as well as the Pager Click handlers. See the DataPage API docs. I have simulated your code , but I couldn't reproduce your problem. In my case , even I click the page button , the data is still filtered. It may be because your select command in your sqldatasource is " SelectCommand="select * from bbcolares" which selects all the record in your database.So when the page posts back , data which the listview bind is the result of this sql. I suggest you could modify your sqldatasource . 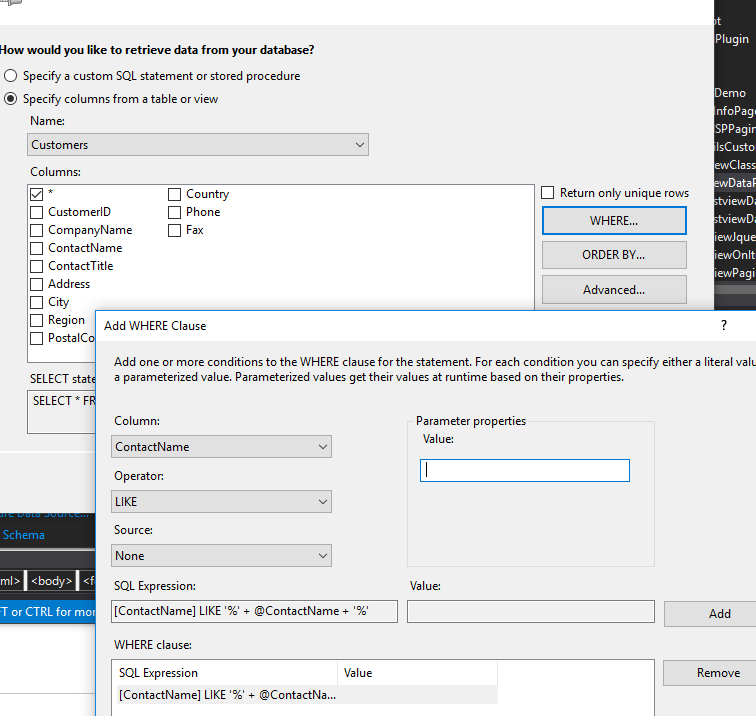 In the configuration wizard, please choose where option to specify where clause.